Home/Bill Britt, Home Upper Right/The Season of Advent Begins! I hope this note finds you doing well. I can’t wait for Sunday as we begin the season of advent – a time of preparation for the coming of Christ at Christmas. If you’re like a lot of folks, every year you say you’re going to cut back, keep things simple, and spend time focusing on the real reason for the season – Jesus. However, every year the pressure mounts to spend and try to meet all the expectations of others. Ultimately, it just seems easier to give in and go along with the commercialization of the season. Overspending, overeating, and busyness rob you of peace and joy, and Jesus gets pushed to the sidelines. We will begin this Sunday by focusing upon the character of Joseph and the realization that God is still in the miracle business. I encourage you to read Matthew 1:18-25 in preparation for the message. In recent days the church has resembled a beehive of activity as folks have helped us prepare for the upcoming days. On Tuesday, members of our dedicated Flower and Altar Guilds spent time decorating the church. 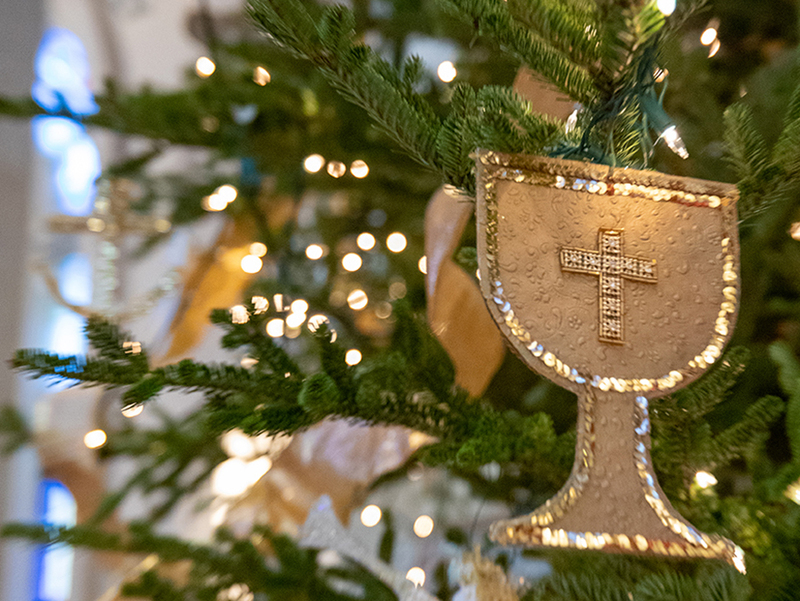 I can’t wait for you to see the Chrismon trees in the narthex and sanctuary on Sunday. In addition, over 80 volunteers transformed the student center into a festive welcome center for the hundreds of clients who will be shopping this week at Christmas Kindness. You are invited to drop by on Sunday morning for the open house to see all that is being done. Also, the Advent Devotional has arrived and is available at no cost in the Dogwood Gift Shop and convenient locations around the church campus for those with limited mobility. Please pick one up this week and join with others from Peachtree Road in using this as a spiritual guidebook as we travel the journey to Christmas together. You may also read the devotional online. I am grateful to all who have given of their time this week as we kick-off a season of preparation for Christmas. Each service begins at 5:30 pm, and I encourage you to be with us this Sunday evening in the sanctuary as the children and youth lead us in the Great Tree Lighting service. They do a wonderful job and this festive service is the best way to begin the season with your church family. First, thank you for your faithfulness in giving this year. Not only have you helped us retire our church’s debt by giving to the $2 million matching opportunity, but you also have helped us stay current with your support of the operating budget of the church. And these are in addition to your record giving to outreach and support of our partners in ministry. Thank you! Second, we do have one more hurdle to clear this year – December giving. The final month of the year is always the most important, and this year is no different. The good news is that if we give as generously as we have the last three Decembers, we will meet the budget. Please make every effort to fulfill your pledge and know of our deep appreciation. Finally, if you have not yet turned in your pledge card for 2019, now is the time to do so. Our Finance Committee will meet next week to begin the process of recommending a budget for next year, and we need to hear from everyone. You may make your pledge today through the church app or online. Thank you for your willingness to be “All In!” at Peachtree Road. I look forward to seeing you Sunday as we begin our journey to Christmas together at Peachtree Road. Remember, if you are out of town this weekend, you can stay connected to your church family by worshiping with us online or through the church app.